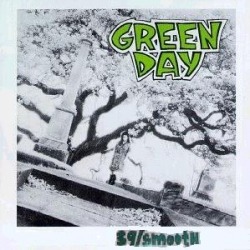 39/Smooth is the debut album by punk rock band Green Day, released April 13, 1990 via Lookout! Records on vinyl (black, green, and clear) and cassette. It would later be combined with the Slappy and 1,000 Hours EPs, plus a track from a compilation, and released in 1991 as1,039/Smoothed Out Slappy Hours on CD and cassette. Jesse Michaels of Operation Ivy drew the artwork on the album. The inner sleeve of the album shows handwritten lyrics by Billie Joe, and letters by drummer John Kiffmeyer and Lookout! owner Larry Livermore to I.R.S. Records, rejecting an offer to sign to the label and declaring their loyalty to Lookout! Records (however, the band would later on leave Lookout! and move to a major label - Reprise Records). 39/Smooth, as well as its concurrent EPs, remained in print on vinyl until Green Day removed their catalog from Lookout! Records in August of 2005 due to unpaid royalties. The album was reissued on vinyl by Reprise Records on March 24, 2009 in a package that also contained the EPs 1,000 Hours and Slappy.